The easter bunny coming to visit this easter doesn’t have to lead to a dietary disaster! It’s possible to enjoy some chocolate easter eggs and hot cross buns over the easter break without totally losing sight of a healthy diet for you and your family. We have some tips to help you out. Hot cross buns are baked with white flour and refined sugars, meaning that they aren’t a great option for yourself and the family! However, there’s good news, you can still indulge in a hot cross bun this easter. Moderation is the key to maintaining a healthy diet, if possible avoid adding butter to your hot cross buns and as tempting as it is stay away from options that contain chocolate chips. If there’s someone in the family that enjoys baking for a healthier alternative you can make your own hot cross buns with wholemeal flour, and as little sugar as possible. Make some time to exercise this easter! Chances are that with all of the festivities over the Easter holidays, you’ll be eating more than you normally do! To compensate for this make sure that you schedule some exercise into your holiday break. So that you don’t get bored vary your exercise routine, jogging, cycling and brisk walking is a great way to burn off those extra calories. Alternatively you can take part in some activities with the kids such as running around with them in the backyard whilst they’re hunting for easter eggs! Your social calendar may be chock a block over the easter long weekend, when you’re out and about, be aware of the number of alcoholic bevvies that you’re consuming! Alcohol contains loads of calories and increases your appetite, as well as decreasing your self control, meaning that you’ll be more likely to eat unhealthy food. As we all know after a big night out, there’s the chance that you may binge on fatty foods the next day. To avoid this from occurring set yourself a maximum of 1-2 alcoholic drinks, and space them out by drinking a glass of water in between each drink. Drinks with a lower alcoholic content are healthier for you, so choose a light beer or a wine spritzer over your regular bevvy. Another tip that will help you avoid consuming too many extra calories is to monitor the portion size of the snacks that you’re eating when you’re enjoying your drink. With many people avoiding meat on Good Friday, easter provides the perfect opportunity for you and the family to indulge in some seafood. Plus, it’s a healthy option, a study provided by the British Journal of Nutrition showed that salmon, lake trout, mackerel, herring, sardines and tuna, increase your blood levels of omega-3 fatty acid, contributing to a healthier body mass index. Helping you to stay trim and healthy! If you can, it’s always best to try and stay away from battered fish and hot chips, sticking with the healthier option of a garden salad or grilled veggies. 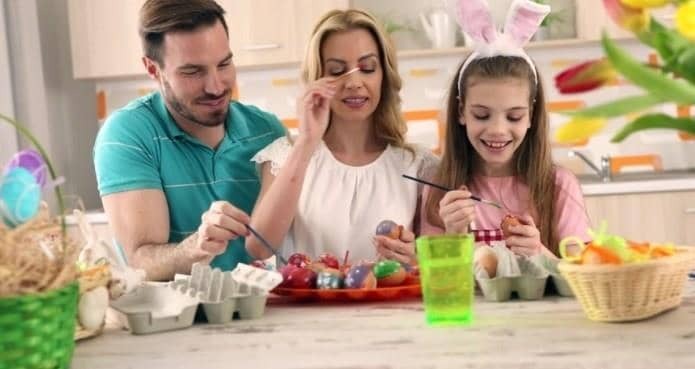 Following these tips will allow you to enjoy some hot cross buns and choccie eggs as well as maintaining a healthy diet and lifestyle over the easter break.